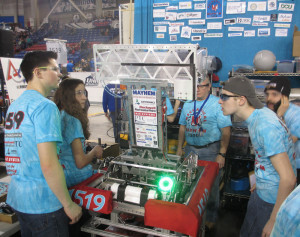 On March 24-26, Mechanical Mayhem participated in ou r first official tournament of the 2016 FIRST STRONGHOLD season with 39 other teams at the University of New Hampshire’s Whittemore Center. For a refresher on the FIRST STRONGHOLD game, see the game animation. After a day and a half of qualification matches at the UNH District Event, Mechanical Mayhem ranked 3rd and was chosen by the first seed Big Bad Bob (319) from Alton, NH, during alliance selection. 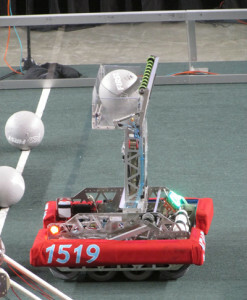 Big Bad Bob invited the Metal Vidsters (1512) from Concord, NH, to round out our alliance for the elimination matches. Mayhem’s and Bob’s ease of crossing our opponent’s defenses along with our high-goal scoring and Bob’s low-goal scoring created a strong alliance. The Metal Vidsters worked in our courtyard defending our tower from attack by the opposing alliance. This strategy resulted in only one loss in all the elimination matches, propelling our alliance to a gold medal finish! Our team congratulates Chop Shop (166) from Merrimack, NH, for winning the most prestigious award, the Chairman’s Award, at the UNH District! We invite you to view our student-created 3-minute Chairman’s Award video on YouTube, our Autonomous Montage video (showing our robot operating autonomously in the first 15 seconds of several matches), and our UNH match videos. Mechanical Mayhem plans to make improvements in the week ahead to prepare for our second competition, the Pine Tree District in Lewiston, ME, on April 8-9. If you are unable to attend the competition in person, check out the webcast. The match schedule and results will be available on the FIRST website. Thank you to our sponsors who are an enabling factor in our success!